Generally, people think of capillaries to be round pipes, with small inner diameter. However, they can be of any cross-section as long as their dimensions are narrow enough so that the characteristics of the liquid combined with the material properties of the wall cause the liquid inside the pipe to rise or fall. This observation is often called capillary action instigated by capillary forces. In the following, I concentrate on situations where capillary action causes the liquid to rise. I will talk about conditions, which are necessary for understanding the function of the feed. The whole topic on capillaries is vast. More detail can be found on the net. The formula and diagram are from Wikipedia. Click on Capillary Action to read more. Indubitably, this formula and graph show the mathematically, theoretically achievable rises, which possibly are approachable under favourable laboratory conditions, however, the highest rise I have ever achieved in my laboratory in fountain pen feed simulation with a 0.5 mm capillary was about 25mm. That’s it. I know that some ingeneers have designed feeds exceeding this limit, but they are useless because they don’t fill. The ink drips off the nib before. It’s hard to obey the laws of nature, sometimes. 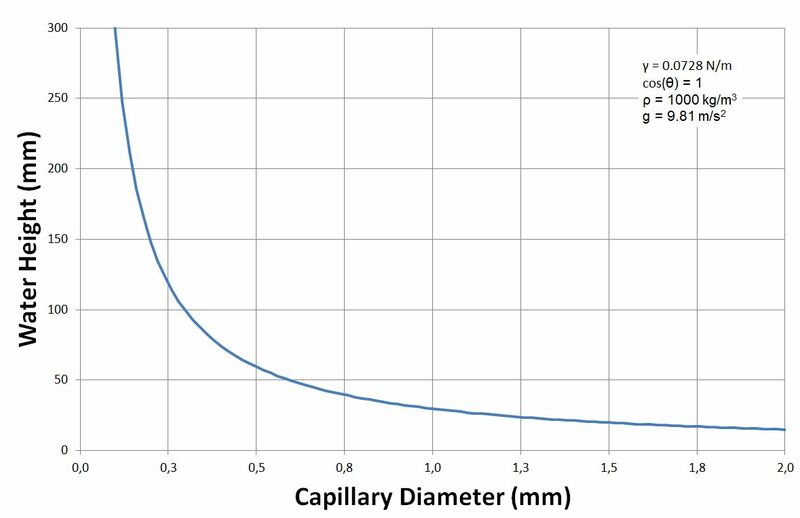 Diagram 2 shows the influence of the width of the diameter of the capillary. All capillary surface reaction is the same, causing the same contact angle θ and therefore the same capillary pull. Also note: The rise h does not change when the capillary is tilted. One could deduce that the rise in the thin tube (1) is higher because of the smaller cross-sectional area A and therefore, the air-pressure causes less force pushing against the capillary force of the liquid. Consequently, the rise in the tube (2) is less because of the larger cross-sectional area A. However, as plausible as it may sound, the above explanation is incorrect. The air-pressure is constant all over the arrangement. It does not only act inside the capillaries but also in the container. 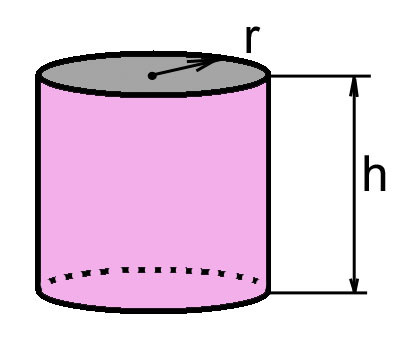 The force acting against the capillary force is caused by the weight of the liquid, which is proportional to the volume. Comparing two capillaries with one being twice as thick, the surface area doubles and so does the surface action to support the liquid column; however, the volume and therefore the weight quadruples. Therefore, as the diameter increases, the rise reduces as shown in diagram 1, because the weight grows by the square of the radius. Got it? Interesting, very interesting, that ‘s where the magic begins, IMHO. 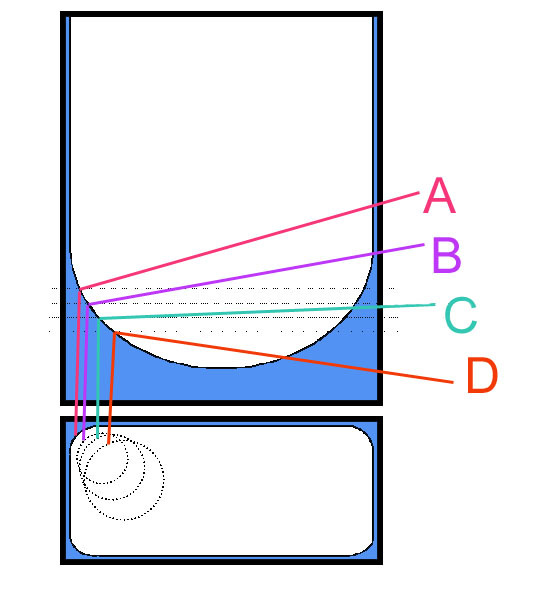 Where a is half the diameter, the radius of the capillary. The rise of the liquid inside the capillary is often referred to as the height of the meniscus. As I said before, and allow me to repeat it, in general, when we talk about or think of a capillary, it is a thin round tube. In a fountain pen feed (and many other items containing capillaries) they are square and most often rectangular. 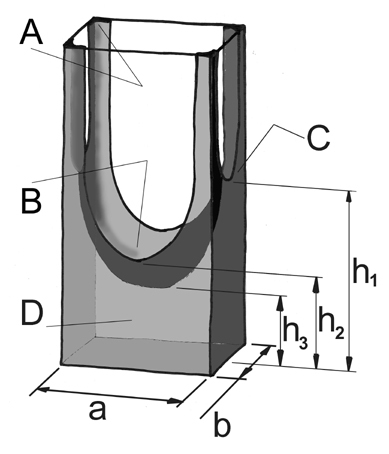 Generally, it is the result of the manufacturing process: it is much simpler to cut an accurate groove (0.3 to 0.5mm wide to a tolerance of ± 0.02 to 0.05mm) than to drill a small hole of the same length and accuracy (it is rather impossible). A drill bit of such dimensions would wander off; it is almost impossible to cool the bit and remove the debris. If the feed is entirely produced through injection moulding (which is now the standard process) a groove is the only way. During most of my research on ink, I used glass tubes. Glass tubes come in all sizes, high accuracies and constant surface properties. The available feeds were not reliable enough. Once I had realised the variation in quality of ink, and before I could start working on the feed, I had to get the ink standardised. Otherwise, when I observed any changes, I would not have known whether it was caused by the ink or the feed. The other dictating parameter was the volume of ink that needed to be supplied. Therefore, in my feed design, I chose a deep rectangular cross section and two grooves in parallel. An added benefit of injection moulding is the sharpness of the corners at the bottom of the capillary groove. They cause a much stronger capillary pull than the capillary itself. Diagram 5 shows the cross-section of a rectangular capillary. The liquid towards the corner experiences a higher capillary pull. One way to explain it, is by imagining that the liquid closer to the edge experiences the pull of a tubular capillary with a reduced diameter and therefore, it rises higher. Understanding what I try to depict, you will recognise the next daring picture, diagram 6, a perspective image of the above. D is the meniscus as it would occur in a round capillary at rise h3. Knowing the sneaky behaviour of fluid in edgy capillaries helps to coerce it to move where the designer wants it to go. In a feed, when writing, the capillaries are face down. The higher capillary force in the corners and along the narrow dimension of the groove help the ink to move forward, especially, after the ink had dried out. More about this later. In the next chapter, with our current understanding, we can now look more closely at the design of the feed… Want to have a look?